What are the documents required for Trade License Cancellation in Dubai? 1. Cancel all existing employees, if any. 3. Get seal and authorized signature of the company on the application and submit at any of the Tas'heel Center. You will get Labour Establishment Cancellation receipt from Tas'heel Centre. 4. Now make ready DED license cancellation form from typing centre, get signature of partner/sponsor and go to DED counter at Tas'heel Centre for License cancellation. � Partner / PRO / Sponsor is required for submission. � Go to the Typing Centre adjacent to Ministry of Labur (MOHRE) in Qusais and get typed a letter in Arabic stating that this license doesn't have Establishment Card. Click here for the specimen copy of the letter. � Take this letter to MOHRE Customer Care counter and get seal. � Now make ready DED license cancellation form from typing centre, get signature of partner/sponsor and go to DED counter at Tas'heel Centre for License cancellation. 5. 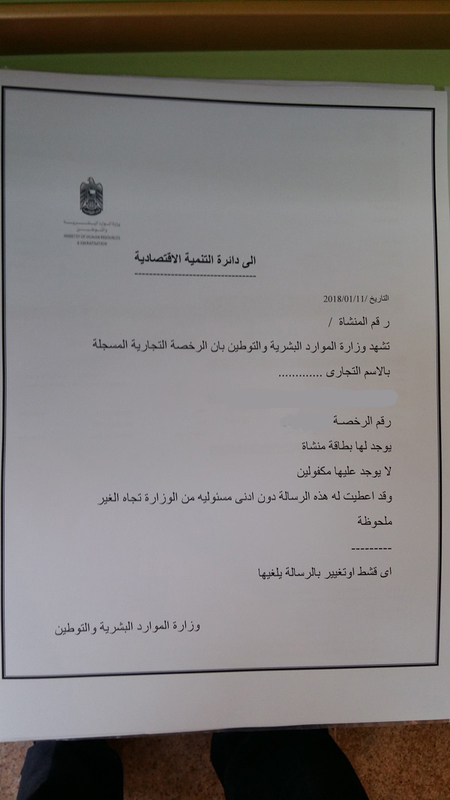 Take this certificate to Immigration office in Jaffliya (or any branch) along with a request letter in Arabic and original Immigration Establishment Card. If the card is lost, you will have to get Certificate of Loss from Police. To get this certificate, prepare a request letter in Arabic and submit it at your nearest police station and pay Dh20. Certificate will be issued after two days. NOTE: No fees required in Immigration for cancellation. But Dh50 fine will be charged for each month after expiry of the card.